Just getting over being extremely sick night before. Business meeting ends mid afternoon, leaving just enough time to ride nearby Big Mountain. A couple business colleagues came along and rented MTBs. 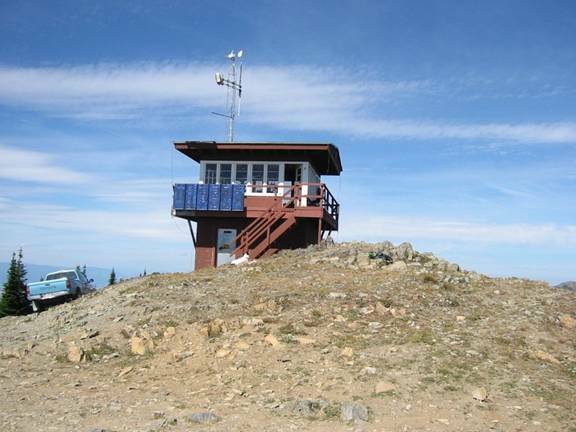 Big Mountain is a ski area, and the gondola runs in the summer for tourists and folks wishing to ride down only. The mountain has an awesome 7.6 mile singletrack trail that switchbacks all over the mountain, in and out of the woods, to the summit. Net gain is about 2200 feet per TopoUSA, but Big Mtn claims 2500 feet. Trail is well manicured and carefully graded. So smooth 5.4% grade can be handled by most fit riders in either direction. 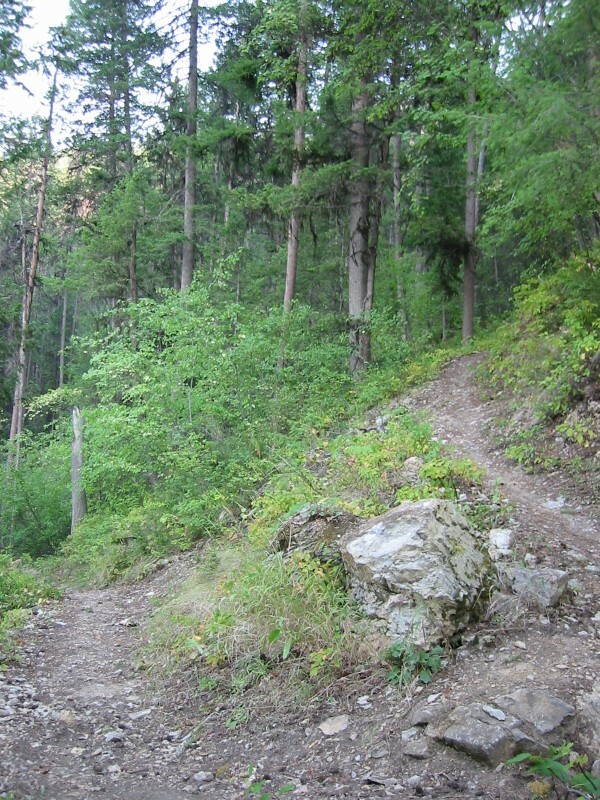 There are additional “expert” downhill oriented trails for those with the proper equipment. Despite being sick for a week, I made it to the top. 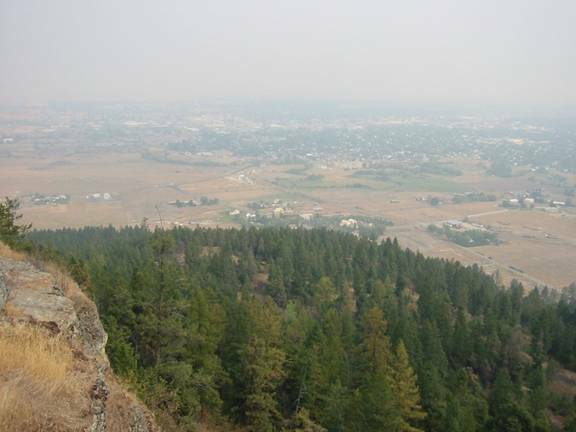 Views were limited at top due to heavy forest fire smoke in area. 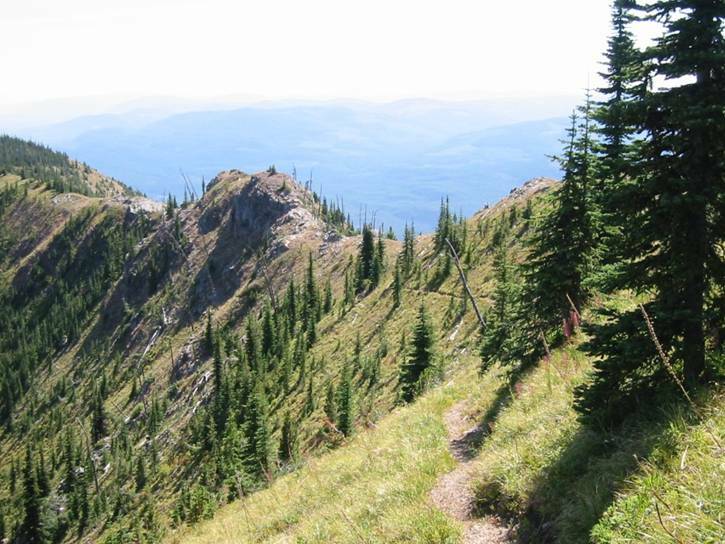 This trail is a pure adrenaline rush descent. Speeds of 30 mph on narrow singletrack were very easy to hit, slowing only for switchbacks. So much fun in fact, I did this climb on two subsequent visits. I let my friends drive the car back to the lodge in town so I could get a few more miles and a bunch more descent in. The base of the ski area sits 1500+ feet above town, so the 4000 foot total descent was nice. Everybody enjoyed the climb. An outside turn you wouldn’t want to blow. 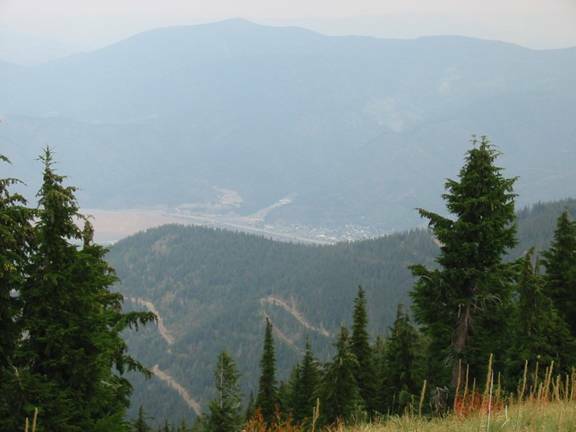 Flathead Valley below barely visible through smoke. Big Mountain from Grouse Mountain Lodge in Whitefish, MT. Finished business banquet around 8pm, just in time to catch the last of the sunset. Strapped on HID light, headed to Lion Mountain, of which the lodge sat in its shadow. Map showed Jeep road to summit, but area was getting built up. Saw some ATV trails but wasn’t sure where they went. Asked a young guy hiking with his dog if any of the trails went to summit, he said all of them do, but they get steep and rocky. I said cool, but thought yeah, whatever. I picked the closest one and started cranking up. 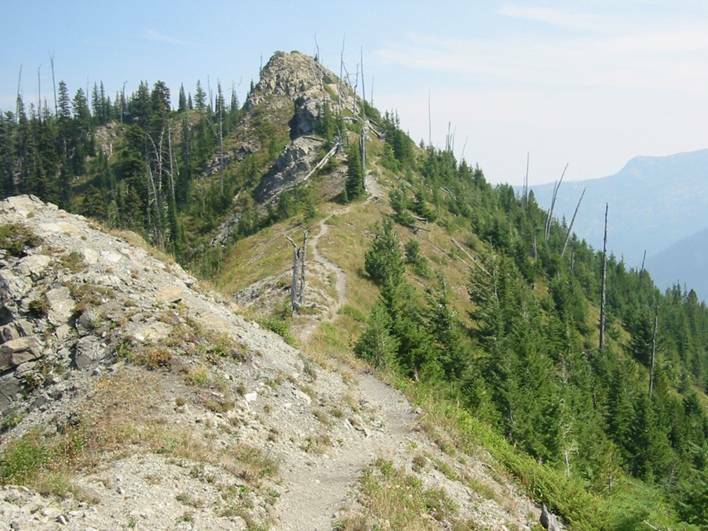 Trail headed up spline of mountain (ridgeline from right to left in photo), turning into impossibly steep and rocky singletrack near top with shear drop-offs to west. Very nice view of remnants of sunset. Had lights on by that time – was dark in woods. Sunsets were brilliant colors due to all the smoke in the atmosphere. To the east was a major lightning storm. Little did I know it was starting a dozen new forest fires in the range I wanted to ride on Thursday, my planned “capstone” ride for the trip. From the southwest on Rt 93, taken on Wednesday evening. Meetings were finished around 2pm, so just enough daylight left to get a good ride in. Starting to feel much better from being sick too. 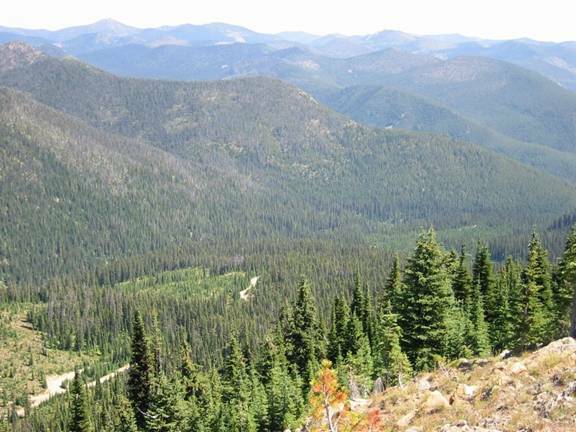 Headed out towards Talley Lake, about 15 or 20 miles east of Whitefish, MT. Many, many miles of ridable singletrack in this area. I do not shuttle, except riding back to car with my bike, so I had to make this point to point trail a big loop using forest service roads. 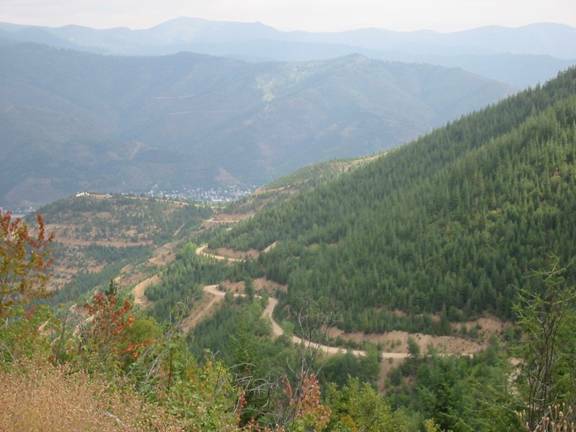 Ride starts with about a 2000 foot climb over 10 miles on good dirt roads. 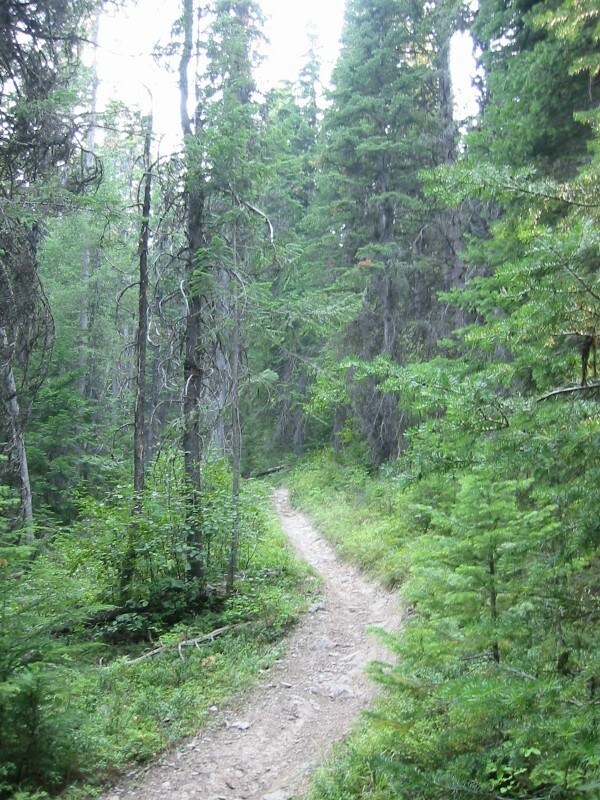 Most of the trail lies in between 5000 to 6000 feet elevation. Nice buff stuff too, only slightly technical in places. Perhaps best part of this 13-mile section of the trail was the switch-backed descent down to Talley Lake, dropping something like 1500 feet in just a couple miles. Very steep grade is traversed, and some switchbacks were too tight for me to navigate. High up on ridge line. Haze in sky is forest fire smoke. Doesn’t look very dry here, but it is. Trees grow very tall and skinny. One of many very steep, very tight switchbacks on descent to Talley Lake. Beginning descent to Talley Lake. Heavy smoke in area limits visibility to just a few miles. 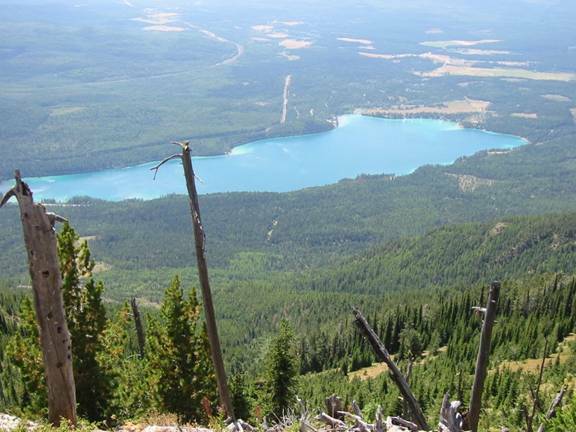 Talley Lake is Montana’s deepest, nearly 500 feet. First full day of mountain biking nirvana. Planned this to be my capstone ride day, but where I wanted to ride was on fire and closed due to Tuesday’s lightning storm. 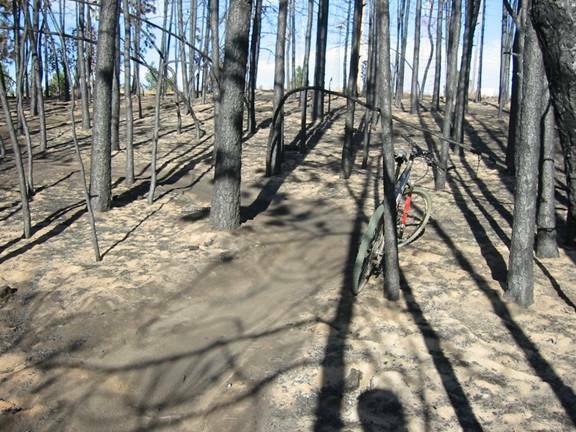 This is the same trail in the same Swan Mountain Range, but about 40 miles south of the fires. This was the only piece of Alpine Trail that was not closed, but in fact the trail was on the border of the closure area. Ride started with mostly flat forest road, some heavily overgrown. Once reaching the Soup Campground, serious climbing began to Napa Point. A 10% grade was maintained for about 7 miles. At Napa Point, trail #31 is taken to Alpine Trail #7. 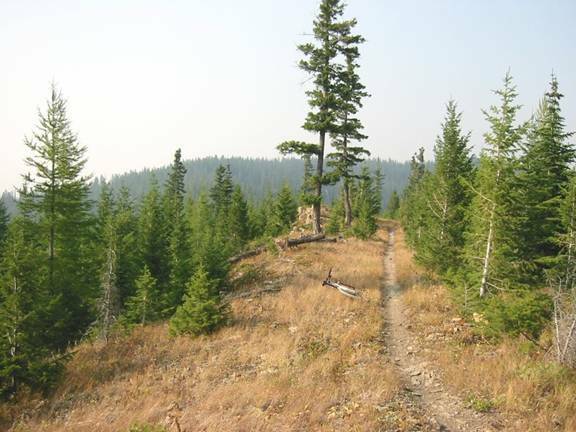 Trail 31 had some very steep hike-a-bike sections, but most of it was ridable, and the views were stunning. 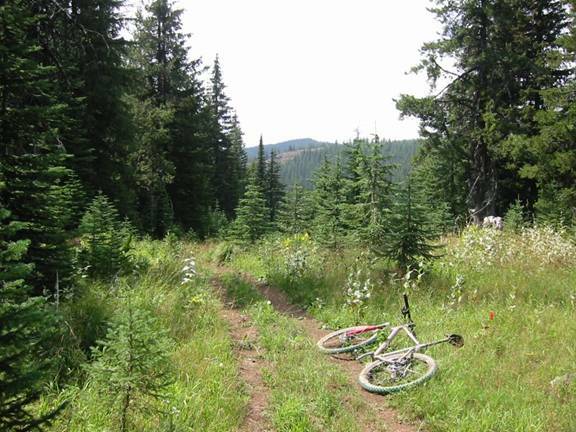 Upon reaching Alpine Trail, increasing amounts of hike-a-bike grades were encountered. It was warm, 22.3 miles registered on odometer, and water was very low. 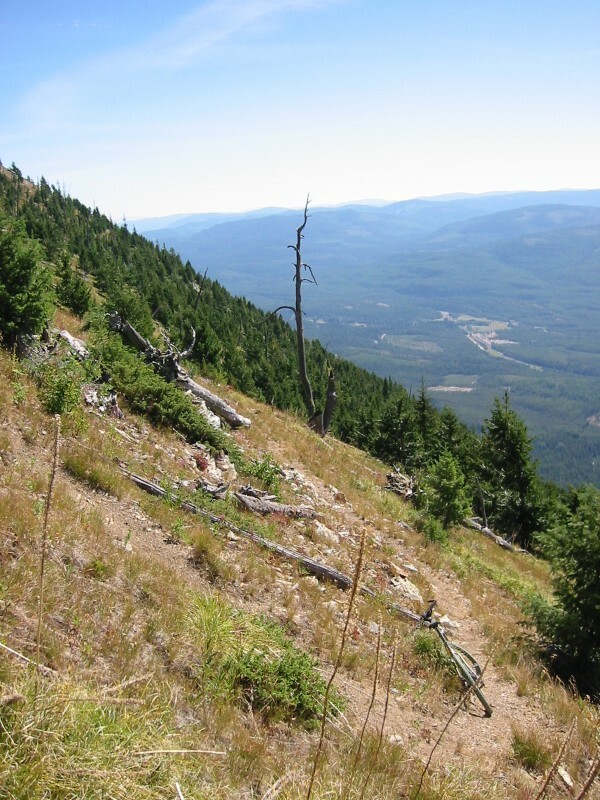 I reached about 7,500 foot elevation on Warrior Mtn before deciding to turn back. Even though it was less miles to keep going, the ridge line was chocked full of numerous 200 to 500 foot hike-a-bike ups and downs. Estimate to complete was 4-6 hours, and I had only 1 hr of water left. I left with 128 ounces. After hiking and riding back to Napa Point, the 4500 foot descent was fully satisfying. The ride to Trail #31 alone was worth it. Truly unique singletrack with views and exposure (near cliff steepness edge riding) to go with it. Hard to watch where you are going with scenery like this. Grades to side were so steep in places that you would almost certainly go for a slide or very long tumble if you slipped off trail. At these higher elevations, air was much clearer and the sky started to look blue. 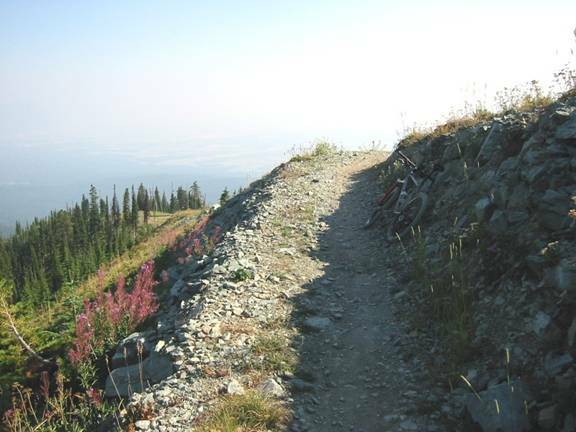 Trail meanders around above timberline at 7000+ feet elevation. A particularly steep section. Wildflowers as far down as you could see. Smoky. Warrior Mountain in background, where I turned around and headed back. Semi-recovery day. 44 miles day before wiped me out good. 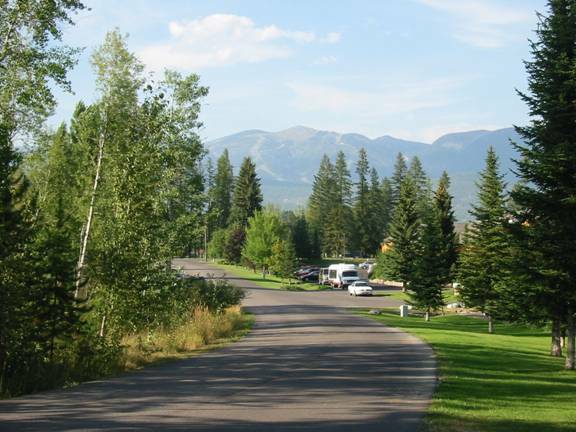 Lone Pine State Park was just a few miles from my motel in Kalispell. 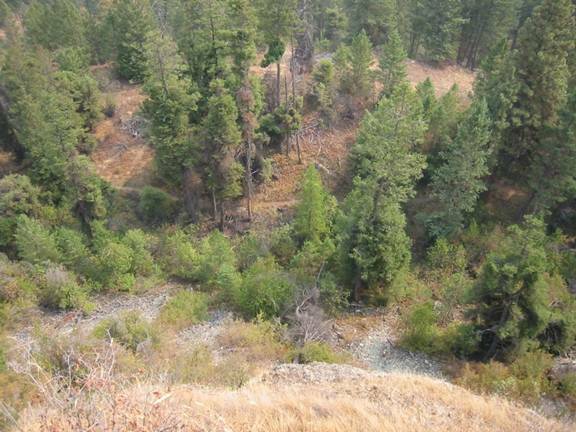 It sits on a good size 600 foot hill, with a cliff drop view of town below in the Flathead Valley. 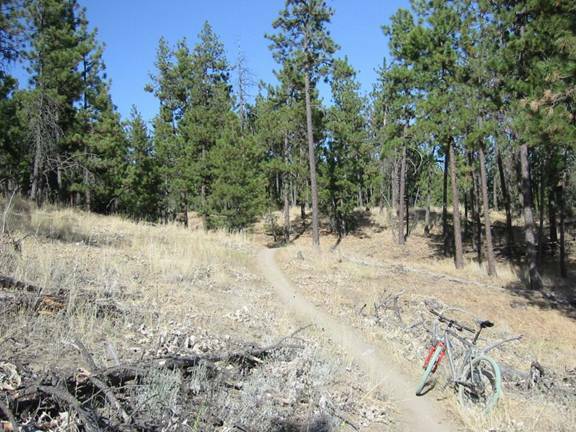 Park has a few miles of singletrack open to riding. It’s steep, so it makes a tough climb or a rocket descent. Did mostly pavement there and back, with about 6 miles on dirt. Nice to have this close by. I revisited this area one more time just before jumping on plane back. The short, mostly pavement ride didn’t quite hit the spot in the morning, so I headed back to Whitefish (only 15 miles away) to do the easy 7.6 mile singletrack to top and back. Easy climb, but wicked fast bomb back down for good adrenaline buzz. A very smoky day, perhaps worst of trip. Swan Range in background hidden by veil. Did not plan to ride here. 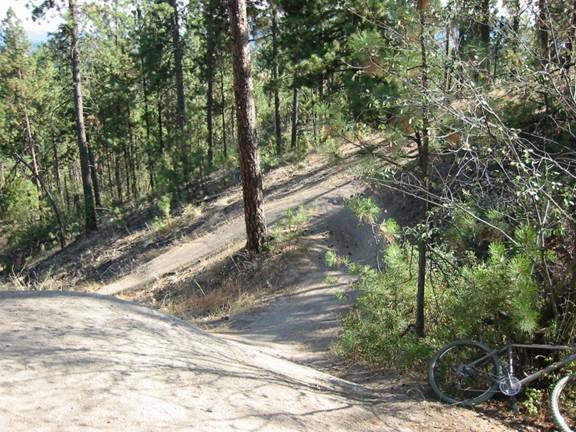 Was planning on riding Canfield in Coeur d’Alene, ID. But when I drove through Kellogg, my eye caught a gondola running up this huge mountain. I looked again, ...and mountain bikes!! The gondola base was right at the off-ramp of Interstate 90, so I had to get off and check this out. Sure enough, a big mountain that can be biked up on service road, singletrack at top. 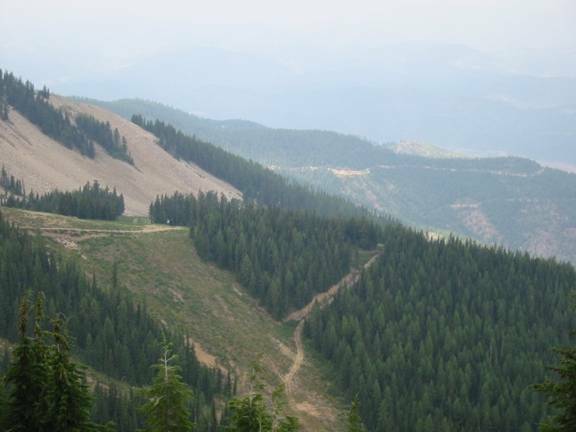 This is an upper elevation ski area. You can’t ski down to gondola – no runs at lower elevations. Gondola is used to go up, where many other lifts service the ski runs. The literature says this is the longest gondola in the world. It’s longer than any I’ve seen, and rises maybe 3400 vertical. Min to max of Silver Mountain (Kellogg Peak) is almost 4000 feet. I climbed it on a 12.5 mile dirt service road, so very modest grade. Singletrack up top was nice, but very limited. Only a few miles. There are two or three forest/service road routes back down. I chose the same way I came up since I was familiar with it and felt the need for some speed. Somehow, I beat four guys on downhill rigs in body armor down. We talked tires briefly up top, then they split. I ate ice-cream bar, then split. When they arrived at the bottom, one said “dude, you’re fast!” Guess he didn’t know what to make of a skinny guy in spandex on a hardtail getting there before he did. I don’t really know how it happened either. They took same road. Early on I could see them below me on switchbacks. Anyway, smoke wasn’t too bad here, so nice views from 6300 foot summit. Ranger in lookout at top was interesting to talk to also. Big tourist mountain, just like Big Mountain in Whitefish. Was quite cold up top. Didn’t plan on riding here until Sunday morning, but had many hours light left and legs weren’t trashed yet. So I squeezed second ride of the day in. If you’ve ever been to the trails at a place called Vietnam near Milford, MA, then you know what this place is like. 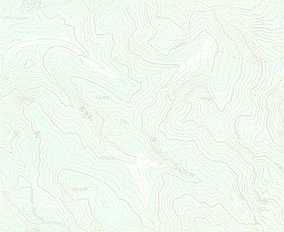 Virtually identical, powerlines up middle, big rock-ledge stunt drops, swoopy roller coaster descents, burned out areas, and climbs. Only difference is this place has at least twice, maybe three times the vertical. Lots of singletrack, place originally built up by dirt bikers, just like Vietnam also. Lots of fun, and right in town. I parked in golf course parking lot. I did have a nasty pinch flat with my tubeless wheel setup. I paid big bucks so I wouldn’t have to suffer pinch flats like I did 5 minutes into the Watershed Wahoo race. Don’t think much of tubeless anymore. Plus, you have to pump your tires up each time you ride. Air here was more hazy than smoky. Mostly overcast skies. Was raining in Kalispell. Was very windy and cold up here. Was a blast to bomb back down this to town in background. Zero smoke and clear skies here. Only ride with these conditions. Lots of this stuff here, often on bare rock, making it extremely fast. Huge area, was hot fire, soil was like talcum power. Did not plan to ride here either. When I drove out to Spokane, I had no maps of Washington or Spokane, so I stopped at a visitor center in Coeur d’Alene along the interstate. Turns out it was in a shopping mall, and I was in spandex. Oh well. 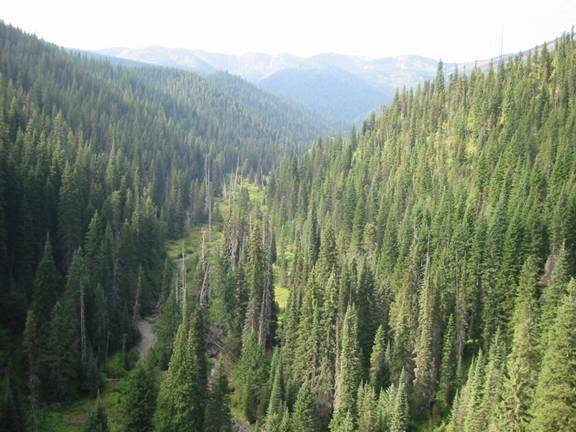 Got really good maps, even brochure listing good places to ride off road in WA and ID, all for free. The Hiawatha Rail Trail was one of them. I was looking for another place to ride while in the area. Now I don’t normally think much of rail trails, but this one was in the mountains, straddled two states, required night riding lights for very long tunnels, and offered many side trails. So on my way back from Spokane, I stopped here. After paying $8 trail fee, the ride starts off by passing from MT to ID through 1.8 mile long tunnel. 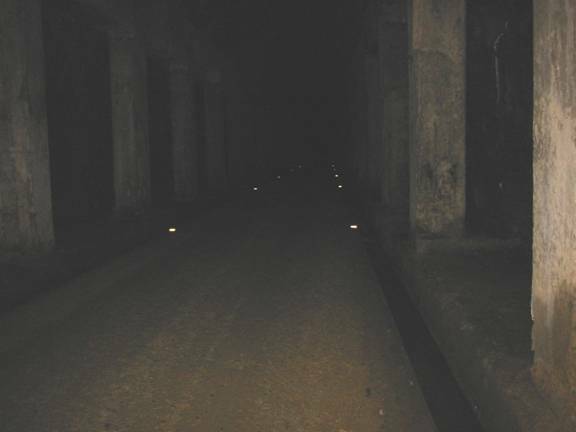 Although tunnel is perfectly level and straight, in center it is totally black and you cannot see light from either end. It is also very cold and very wet with water dripping down everywhere. Near the center (state line), TopoUSA tells me there is nearly 1000 feet of rock overhead. 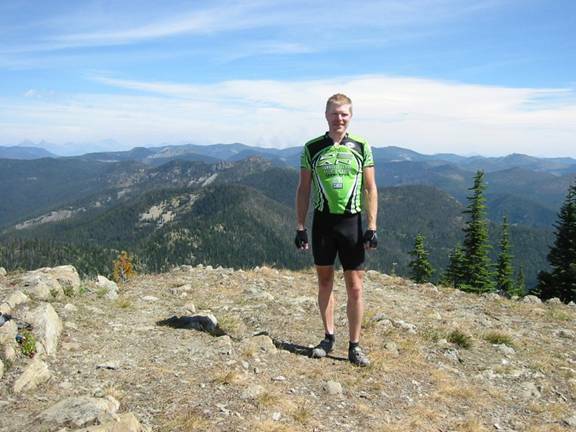 After emerging in ID, the ride becomes very scenic beginning 13 mile descent from the mountain pass at 1.8% grade. 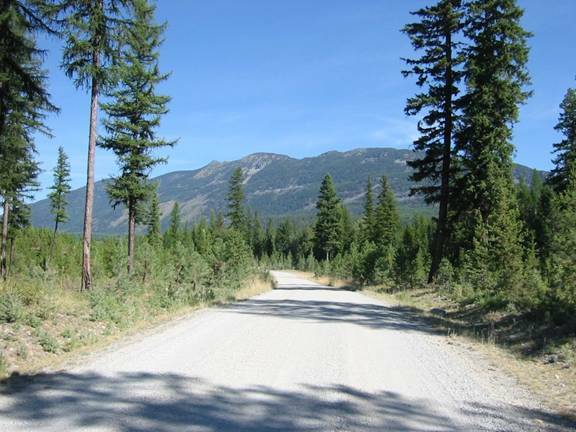 Firm gravel surface made for easy, fast descent. 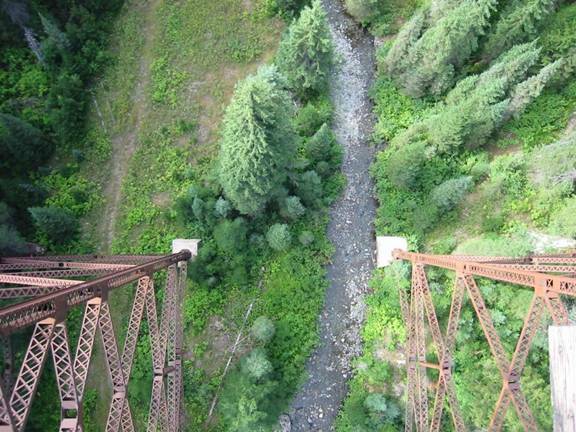 Eight more tunnels, some requiring lights, and seven high steel trestles were crossed. Coming back up, I must have passed hundreds of riders. Very strange to see all equipped with lights in bright daylight. I took forest service road good part of the way back up to pass to get away from crowds, then took FS #506 up to Roland Summit, a 1000 ft climb in 2 miles. No singletrack, but one of the most unique rides I’ve been on. Reflectors kept you out of gutters which carried rushing water to entrances. 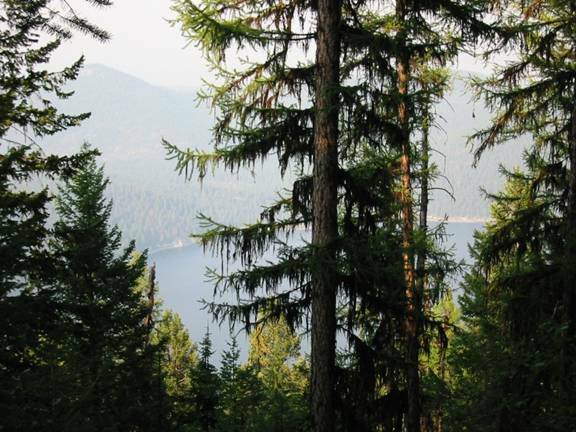 Trees are probably >100’ tall. Made me queasy. 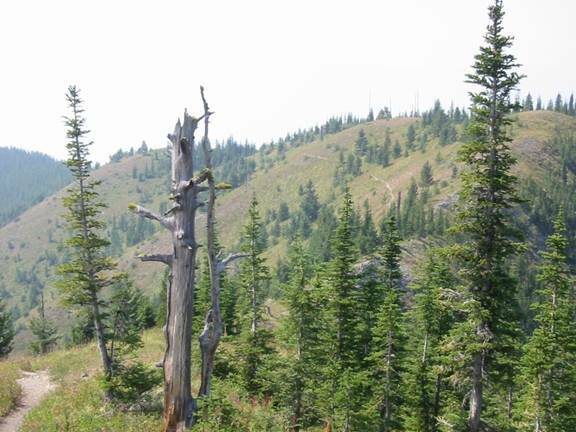 Follows MT/ID State Line on Ridgeline at 5000 to 6000 Feet Elevation. 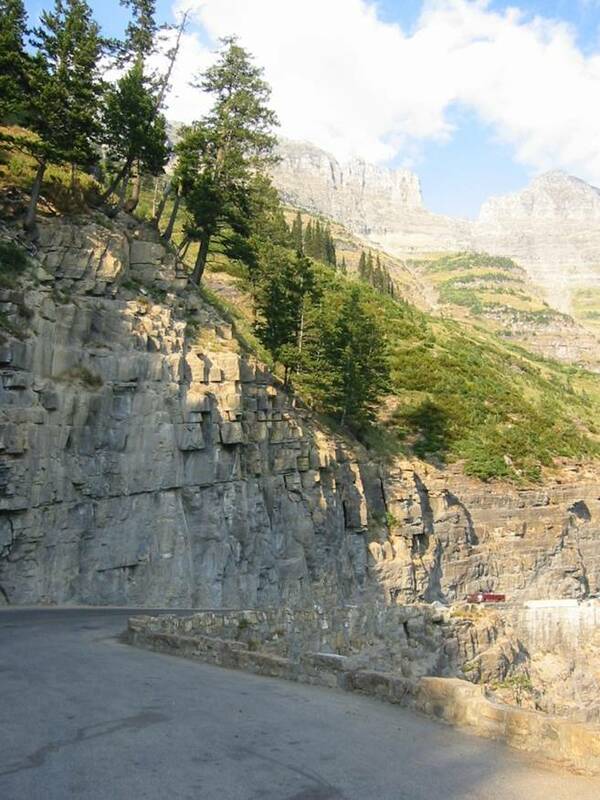 Was able to get into Glacier National Park on the least smoky day of the trip. 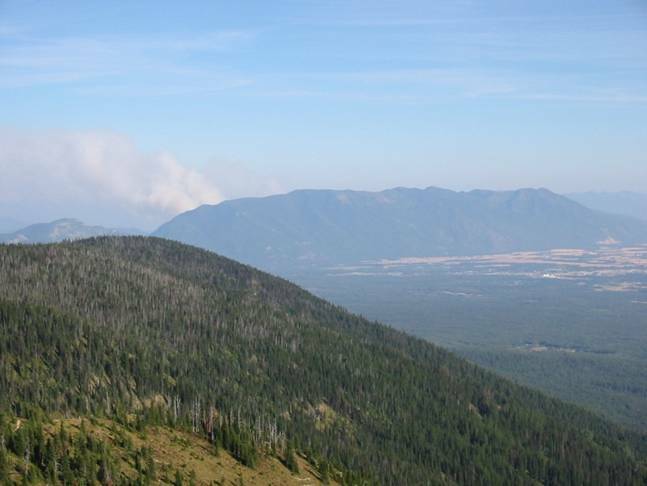 Wind conditions were just right that there was no smoke being imported into the Flathead Valley from 100 miles away, and smoke produced by the Robert and Beta/Dorris fires was not carried into the most scenic areas of the park. 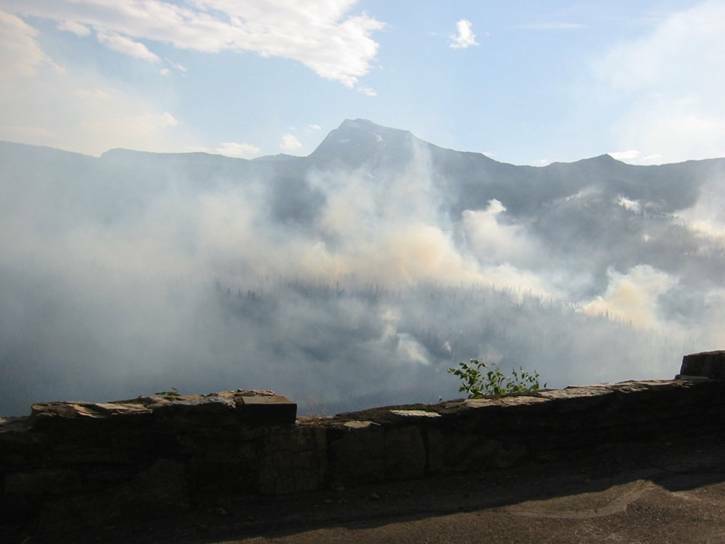 I did drive by the Robert fire on the Going to the Sun Road, however. No stopping allowed, so couldn’t get pictures. You really can’t appreciate how big a 46,000 acre fire is until you spend an hour driving along side one. 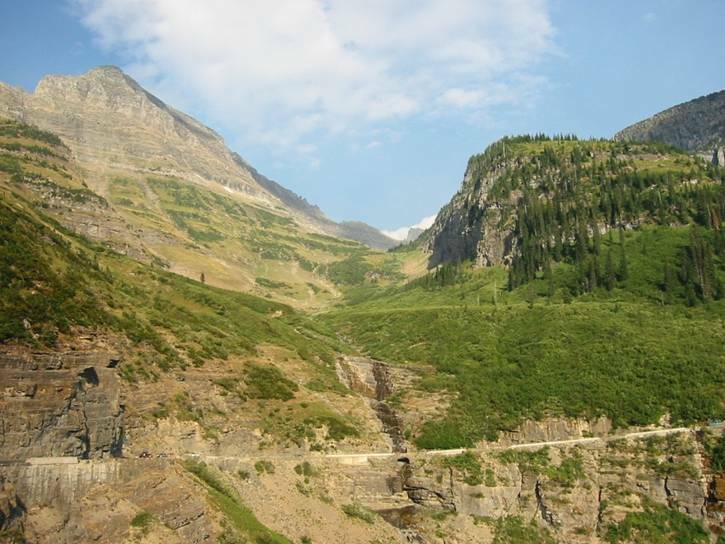 Once heading up to Logan Pass, I was amazed by the scenery here. Unlike anything I’ve seen, and it has to rival sights in Yellowstone or Grand Canyon national parks. 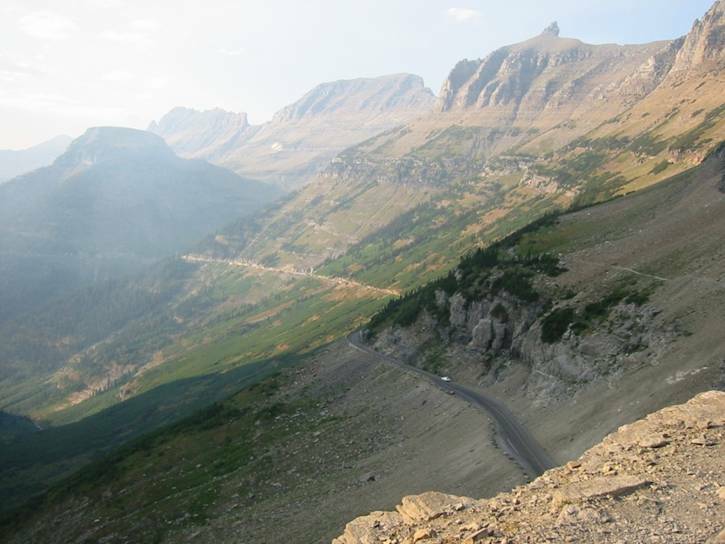 I parked at Logan Pass, about 6600 feet elevation. I did some hiking both sides of the road, on Garden Wall and Hidden Lake trails. 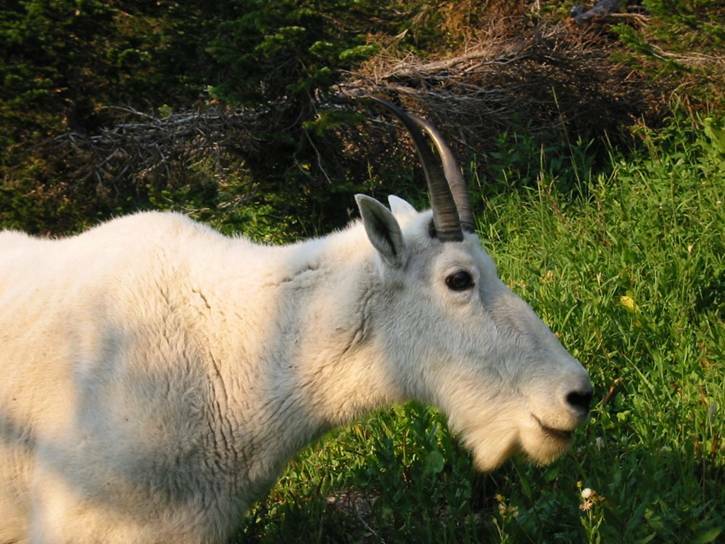 Lots of free roaming, almost tame, mountain goats here. It was near sunset when I parked, having ridden the Hiawatha trail earlier in the day. Very tight, little guardrail protection with shear drop-offs. 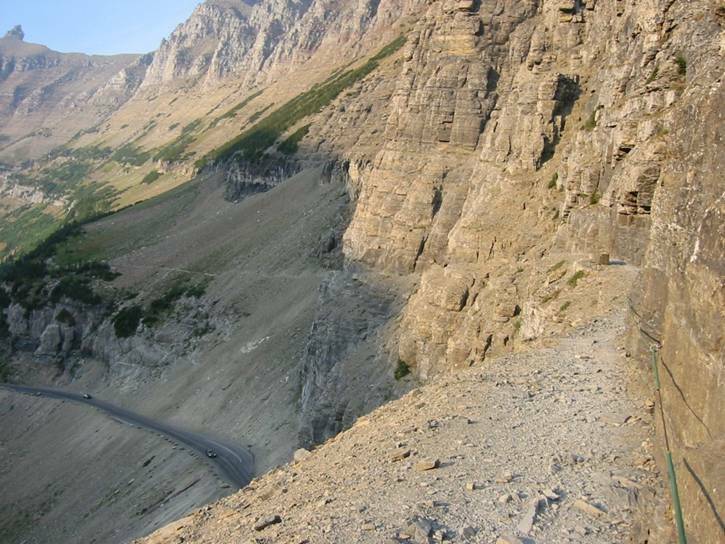 Going to the Sun Road 100-200 feet straight down from narrow hiking ledge. Zoom-in showing narrowness of trail and cable to hold on to. The wind blows with considerable force here, and I had to lean against the rock to be steady enough to take photo. Didn’t quite like the way she was looking at me. The young’n was nearby, and these things are quite big with sharp horns. Quite tolerant of tourists though. On ride back down, saw huge flare-ups of big trees going like blow torches. Would shoot a narrow column of flame 100-200 feet into air for several seconds, then tree would be spent. Was some of the most impressive natural phenomena I’ve seen. Had to get a shot of me framed by the pass. 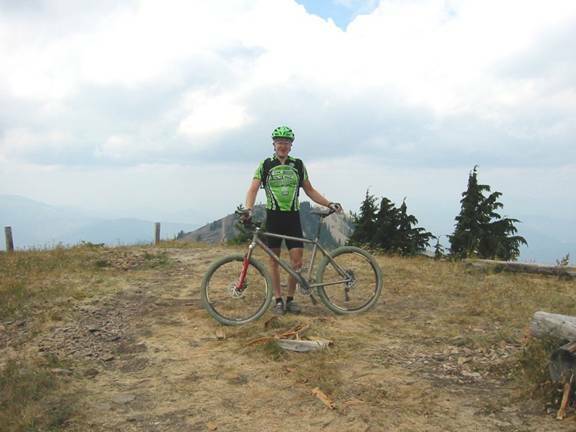 Rode here on recommendation of the good folks at Glacier Cyclery in Whitefish. 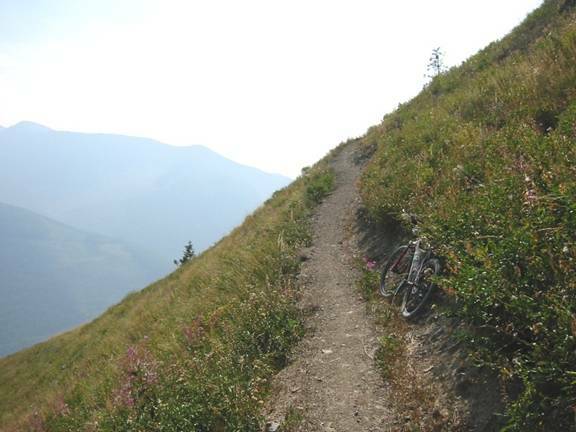 Since my planned big ride in the Swan Range was closed due to several new fire starts, I told Jan I was looking for a big climb, some ridge riding above 7000 feet, and a nice singletrack descent. Mt Marston fit the bill perfectly. Nearly 4000 foot gain in 14.7 miles on gravel forest service road, about 5 miles of mountain-top ridge riding, then a 5 mile hold-on-and-pray descent. This was the clearest day of my stay in MT, so the visibility here was maybe 50 miles. Could see plumes of smoke going up all over the US and Canadian Rockies. Mt. 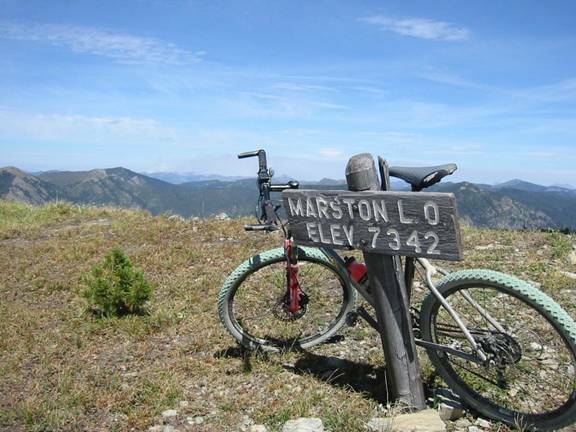 Marston is only about 15 miles from the Canadian border, and is one of the highest peaks around at 7342 feet. The descent offered several areas I considered “no-fall” zones, where the terrain was so steep that if you slipped off the narrow ribbon of trail, you could easily slide down slope and fall off a ledge. From bottom, you can’t see a path down the face you descend, it’s that steep. This ride is easily rated my “capstone ride” for the trip. From parking area. Looked a lot like Mt. Washington from here. Followed stream in valley bottom until last few miles. Ranger lives up here for whole season. Her dog really wanted my Clifbar. 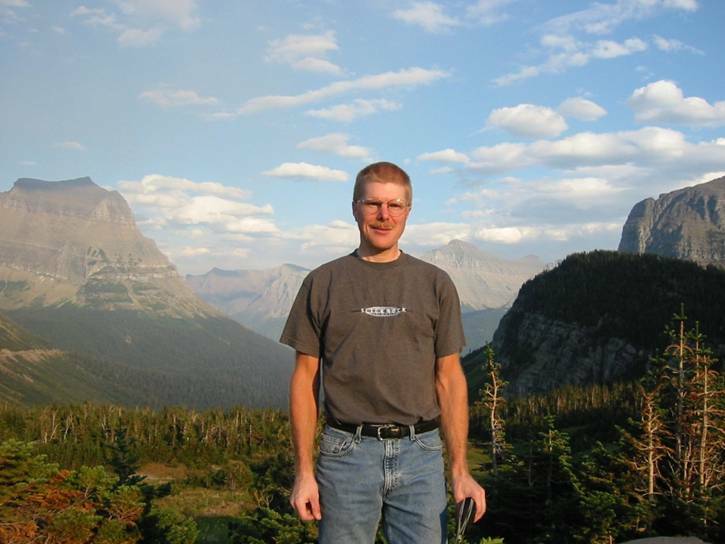 Canadian Rockies forest fire plum visible off my right shoulder. TopoUSA digital maps never agree with these things. It is way more radiant turquoise than photo captures. Some scary steep stuff here. Views every way you looked were just incredible. These switchbacks were impossibly steep for me to navigate. Slope at steepest part of switchback had to be 100% (45 degrees). I couldn’t even walk on slope-side to take this picture without using my hands. If you started sliding, you might never stop. With visibility so good, I just had to swing by Big Mountain on my way back to Kalispell. Was glad I did. Could see everything I was missing on my previous two visits. 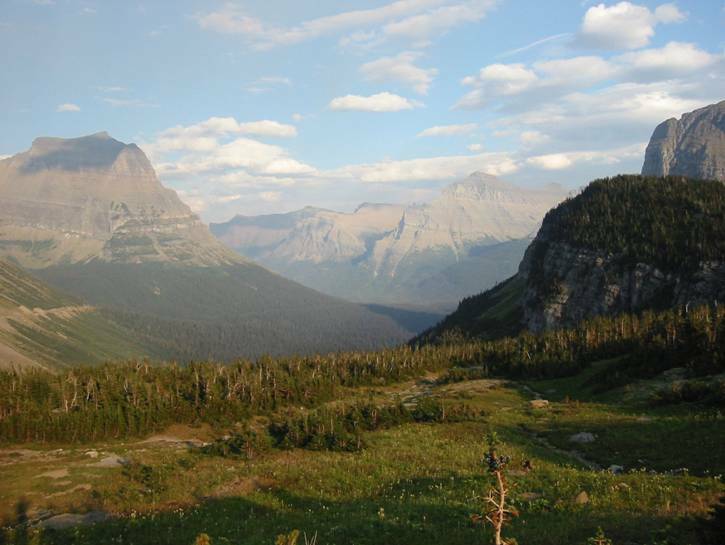 Could see all the big peaks in Glacier NP, the Flathead Valley, and the Swan Range with Beta/Doris forest fire plum. Still a little smoke around, but could see at least 20 miles, 10x better than most prior days of my trip. 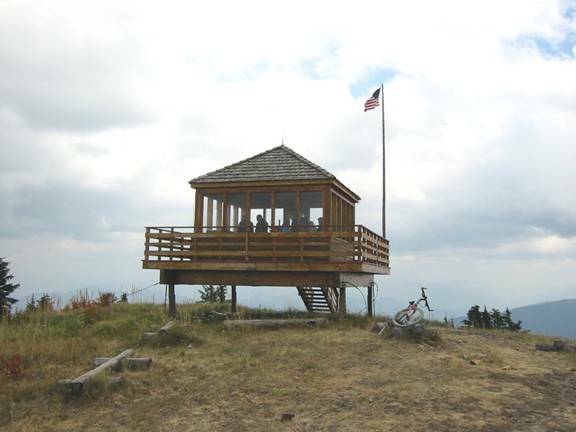 Had just enough in my legs to do the 7.6 mile, 2500 foot climb to the summit one last time for the trip. Even with 5200 feet of climbing in my legs, still managed to climb it in one hour flat in middle ring. Hung around for a while up top this time. Bought Cathy a T-shirt, soaked in the views. 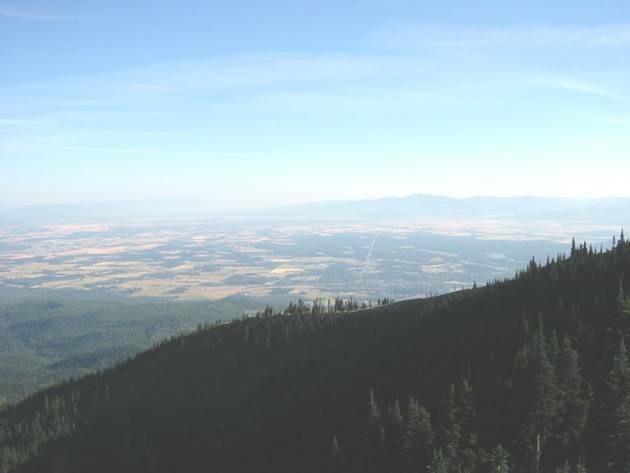 Whitefish is at base of mountain in foreground, Kalispell is at base of mountains off in distance down Rt. 93 heading straight away. Much of the valley was and still is ranch land. The plume of smoke going up is from the Beta/Doris forest fire complex. 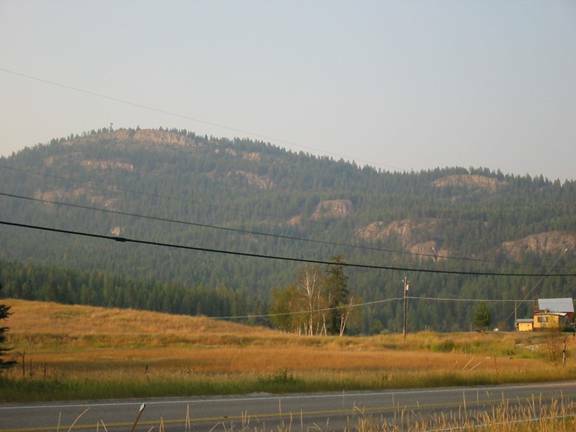 My planned capstone ride for the trip was to ride up Strawberry Mountain on the right side of image, ride the length of the ridgeline shown in photo (about 20 miles), then come down Columbia Mountain where the smoke is going up. Would have been about a 45 mile ride, including road back to car. Unfortunately, a dry lightning storm moved up the length of the range, starting over a dozen new fires on Tuesday evening. 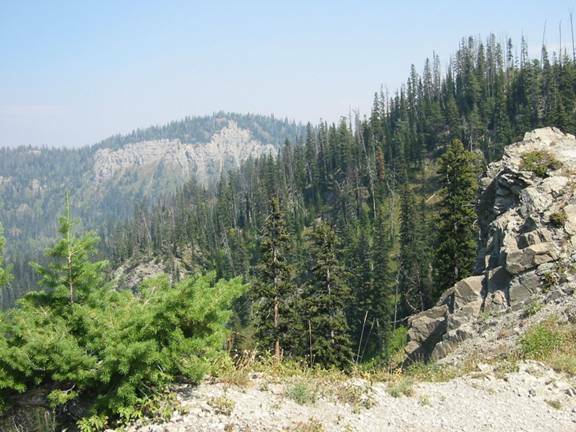 By Wednesday morning, the forest service had closed the whole area to all use. Not a big deal. Mt. Marston to the north presented a similar challenge with similar views. At last check, the fires on the back side of this range have consumed over 10,000 acres and threaten a hydroelectric dam. My final ride of trip. Smoke was back after a near perfect day on Monday. Went back to Lone Pine for a short, time-wise safe ride before having to box up bike and head to airport. Hit some different bits of singletrack this time. Small park, but just fine for short ride right from town. Despite heading out while still sick and riding opportunities being limited by fire closures, the trip was as good as any of the others I’ve been on such as Moab, Tucson, SoCal, and the Badlands. There’s a chance I might get out there again (company business, of course), so what couldn’t be ridden this time will get ridden next time. This happened in SoCal. When I went out in November, the entire Angeles National Forest was closed due to extreme fire risk. When I went out again in February on different company business, enough rain had fallen to allow lifting of the closures. 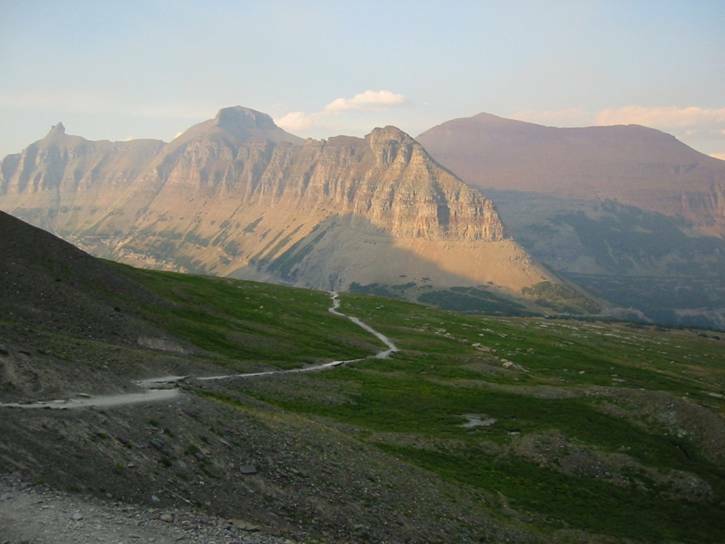 If I make it out to Montana again in the summer, I hope to hit trails in the Robert Fire closure area, the Swan Range, and ride Going to the Sun Road, which is also closed to bicycles right now due to close proximity of fires. I could always XC and DH ski in the winter. So I can now color in three more states on my US map of states where I’ve mountain biked. This brings the total to 27 states, past the half-way mark of riding all 50 states.